The 2017 indoor track and field season culminates this weekend at the 2017 NCAA Indoor Track & Field Championships in College Station, Texas. 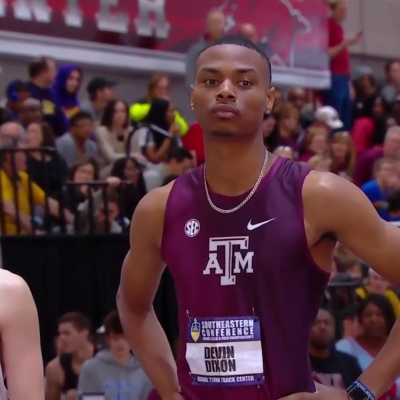 We’ll be on-site in the Lone Star State starting Thursday, but before we get down there we’ve previewed the mid-d/distance events so that you can know what to watch for at the meet. Below you’ll find our look at the women’s 800, which could see the collegiate record fall for the second time this season. TV/Streaming: The meet will be streamed live on Watch ESPN. Jazmine Fray SO Texas A&M 2:00.69 2:00.69 Unbeaten this season and set NCAA record out of nowhere in Feb.
Hanna Green SR Virginia Tech 2:02.28 2:02.28 3rd in ’15, 2nd in ’16, can she take the final step in ’17? 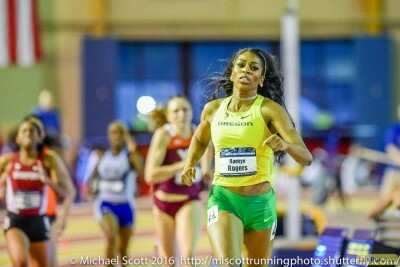 Like the men’s 800, the women’s 800 at NCAAs is a must-watch event this year, and while the depth is admirable, it’s the showdown at the top of the field between collegiate record holder Jazmine Fray of Texas A&M and defending champion Raevyn Rogers of Oregon (#3 all-time NCAA), who has won the last 3 NCAA 800s that have been run, that intrigues us most. Behind them, four of the top five from NCAA Indoors last year (runner-up Hanna Green of Virginia Tech, third-place Olivia Baker of Stanford and fifth-place Shea Collinsworth of BYU) are all back as well, but it will come down to a battle between Fray and Rogers. Here’s why: both have shown themselves capable of reaching a level that no one else in the NCAA can. Fray stunned everyone with her 2:00.69 collegiate record on February 11 (a 2.56-second PR) and followed it up with a comfortable win at SECs. Rogers, meanwhile, has lost just once to a collegiate runner at 800 meters since April 2015. That includes three straight NCAA titles, and all have followed a similar pattern, with Rogers moving hard with 200 meters to go and ripping the field to shreds. She’s raced sparingly in 2017, running three relays and two individual races (she was also listed as a DNF at the MPSF champs), and though her times are slightly behind what they were last year (1:26.97 600 & 2:01.75 800 in ’17 compared to 1:26.34 600 & 2:00.90 800 in ’16), they’re still exceptional by anyone else’s standards. 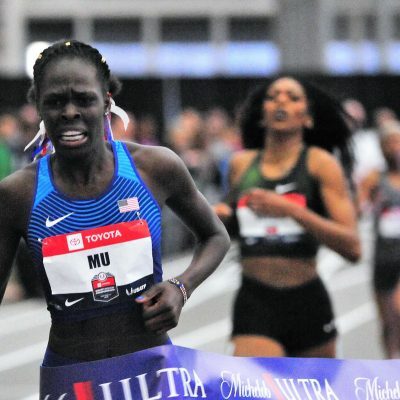 We suspect she could have run faster in the 800 had she found herself in a fast race like Millrose (where she ran 2:00 last year), so the fact that she ran slightly slower this year doesn’t concern us. Plus one of the relays she ran on — the DMR — wound up setting a collegiate record. With the 800 prelim and DMR on day one and 800 final and 4×400 on day two, Rogers will have a heavy workload at NCAAs, so Oregon likely wanted to train her hard in the regular season and rest her up for nationals rather than risk overracing her. Rogers has been utterly dominant at NCAAs in the past and we expect her to bring her A game to College Station, where the Houston native should have some good support. Of course, just because an athlete has been unstoppable in the past doesn’t mean that they’re invincible. And the collegiate record holder seems like as good a candidate as anyone to defeat a superstar like Rogers. The big question is how will Fray cope with the pressure of being among the favorites? She ran at NCAA outdoors last year (eliminated in semis) and the SEC is the nation’s most competitive track and field conference, so it’s not as if Fray is a total newbie. But in this case, she’ll have a target on her back as the NCAA record holder. As good as Fray is, we imagine she wants no part of Rogers’ killer final 200 (Rogers closed her last lap in 29.4 last year, a second faster than anyone else in the field) and will try to win it from the front, a strategy that has worked for her so far this season. The problem is, even a 2:00 from the front may not be enough to drop Rogers. At NCAA outdoors in 2015, Natoya Goule tried to drop Rogers with a ridiculous 56.17 first 400 but Rogers simply hung back and let Goule drag her to a 1:59.71 victory. Fray won’t be going out in 56, but the point remains: it’s almost impossible to drop Rogers. 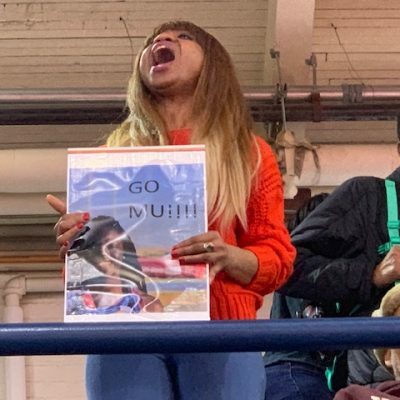 The argument for Fray is that, even after her massive breakthrough 2:00.69, we haven’t seen the sophomore’s true ceiling yet. Perhaps Rogers will bring it out of her. We shouldn’t overlook BYU’s Shea Collinsworth, either. She’s battle-tested at NCAAs (she was third outdoors and fifth indoors last year) and she’s not too far from the collegiate record herself: her 2:01.42 at Iowa State on February 11 was #5 all-time by a collegian. Put her in a race with Fray and Rogers and she could go even faster. Virginia Tech’s Hanna Green has also been to three NCAA finals, placing fifth, third and second, and she’s coming off an indoor PR victory at ACCs (2:02.28). Stanford’s Olivia Baker has great speed (World Junior 400 bronze medallist in 2014) and was the runner-up at NCAA outdoors last year. She hasn’t run quite as fast this year as the other top contenders, but she is coming off a dominant win at the MPSF meet as her 2:03.41 was over two seconds ahead of the runner-up. LRC prediction: Fray may be the collegiate record holder, but Rogers is a monster at NCAA championships and we think she’l win her fourth NCAA title in College Station, if she’s healthy. Depending on how fast the race goes out, we could see a new collegiate record as well. The only thing that makes us unsure of picking her is her bizarre DNF at the MPSF meet. She looked fine, didn’t look hurt and just stepped off the track with 100 meters to go. We think she may have been rabbitting her teammate (Brooke Feldmeier who was in third). If you know, email us as the Register-Guard has an article on her today but doesn’t even mention it nor did the Oregon press release. If she’s not 100%, she’s not beating Fray. Who will win the women's 800 at 2017 NCAA Indoors?